You don’t need to set up expensive business phone service just to get a simple toll free number that forwards to your cell phone. With UniTel Voice, you can get 1-800 number that forwards calls straight to your cell phone’s telephone number or use our smartphone app (for iPhone or Android) to receive calls, make calls, and manage your business voicemail. In both cases, you can keep your existing cell phone (doesn’t matter what kind: AT&T, Sprint, T-Mobile, Verizon, Boost Mobile, Cricket Wireless, smartphone or flip-phone), keep your personal calls separate from your business calls, and keep your business voicemail separate from your personal voicemail. UniTel Voice is priced and designed to help on-the-go entrepreneurs, bootstrapped startups, and solo side-gig hustlers run their business from their cell phones, yet look and sound like a Fortune 500 company. 1. Toll free 800 numbers are cheap & easy to set up and can forward to any phone. With UniTel Voice, for less than $10/month, you can sign up instantly for a 1-800 phone number and ring it to any of your existing phones (cell, home, office, Skype, Google Voice, softphone, smartphone, VoIP phone, or landline telephone). You simply pick your 1800 number, create your account and type in the forwarding number. You can also download our free mobile app and use it to make outbound calls, receive inbound calls, and manage your toll free 800 number’s voicemail. 2. Toll free number service includes some simple features that make your life easier. UniTel Voice offers some really cool toll free number features that make running your business from your cell phone easy and convenient, so you always sound professional and stay connected. You don’t have to use it, but the UniTel Voice smartphone app is free and it will enhance your toll free service experience by allowing you to make outbound calls, receive inbound calls, transfer calls, manage voicemail, faxes, and call logs. UniTel Voice offers advanced toll free forwarding features that allow you to forward your toll free number to any phone, group of phones or voicemail. You can even set your call forwarding to change based on the day of the week or time of day. For example, during the day your you could receive calls on your office phone, during the evening you could receive calls on your cell phone, and at night you could send calls straight to voicemail. UniTel Voice gives you the ability to set up a virtual voicemail box for your toll free number. You have the option to use your cell phone’s voicemail or set up a different voicemail for your 1-800 number altogether. You can manage your voicemail online or via the mobile app. You can also set voicemail-to-email and receive voicemail sound files and voice-to-text transcriptions sent directly to your email inbox. With UniTel Voice, your toll free telephone number doubles as an internet fax line (also known as an eFax). That way you always have a fax line available that allows you to both send and receive faxes without the need for an old-school fax machine. You can send and receive toll free SMS text messages using your toll free number. Even set up autoresponders and receive text messages as emails with the ability to reply to the email and have it sent as a toll free number text message. 3. Getting an 800 number makes you look professional, but there’s more you can do. Displaying a 1-800 phone number on your website and in your advertisements looks more professional than a using a local telephone number, but there are other things you can do with you your 800 number service that will give your business trust, credibility and impress your customers. You can use a vanity 800 number that’s easy-to-remember and boosts your brand or value provision. 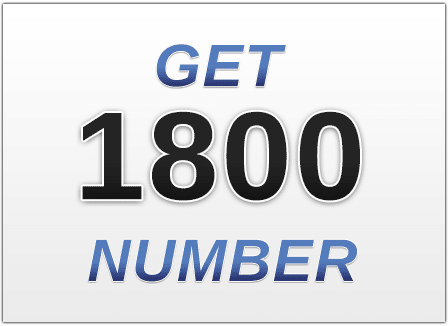 If the 800 number you want isn’t you can find vanity toll free numbers in other toll free prefixes including 888, 877, 866, 855, 844, 833 and (next to be released) 822 toll free numbers. With UniTel Voice you can simply forward your toll free business number directly to your cell phone or you can set up an auto attendant that greets callers, and offers a menu of extensions to select. For example, an auto attendant script might sound something like this: “Thank you for calling ABC Consulting…for sales press one, for support press two”. Even if you’re a one-person business, you could have your sales calls and support calls forward directly to your cell phone. To callers, you sound like a big, established business. PBX phone systems use to be super complicated (and super expensive), but today with cloud-based business phone system, they couldn’t be simpler or more affordable. In fact, your toll free number includes virtual PBX features that are built in, allowing you to not only have a toll free number but a professional business phone system that’s as easy to set up and manage as email. Editor’s Note: This article is brought to you by the marketing team at UniTel Voice, the virtual phone system priced and designed for startups and small business owners.